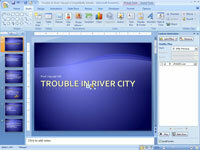 Sometimes, you want a PowerPoint sound file to play while you display several slides in your PowerPoint presentation. 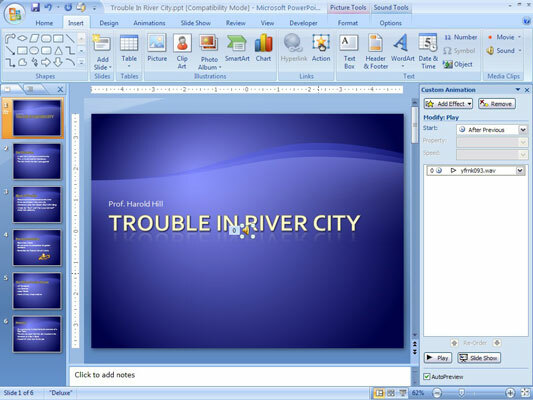 PowerPoint stops a sound when you move to the next slide. You can alter this behavior in two ways. First, if you want a sound to play from the current slide all the way to the end of the show, select the sound, call up the Sound Tools tab on the Ribbon, and set the Play Sound option to Play Across Slides. This calls up whichever sound you want to edit. 2Choose the Animations tab on the Ribbon and then click Custom Animation in the Animations group. The Custom Animation task pane appears to the right of the slide. 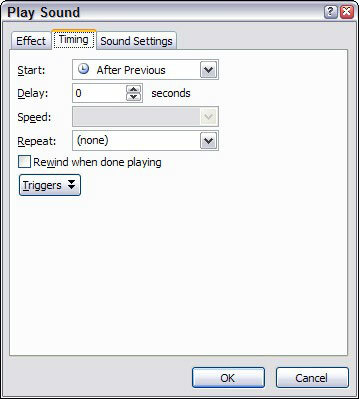 3Click the down arrow next to the sound item and then choose Effect Options from the menu that appears. This action summons the Play Sound dialog box. 4Select the After option (in the Stop Playing section) and then set the number of slides you want the sound to play for. 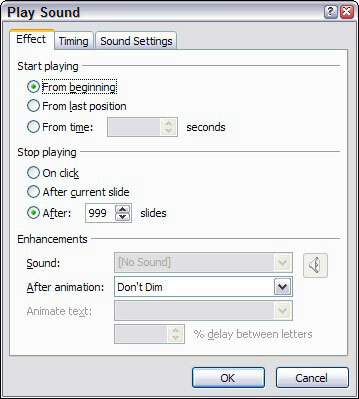 6(Optional) Right-click Effects Options to open the Play Sound dialog box, and click the Timing tab.